Is multisourcing over? It's only been a couple years since business experts were hailing it as something that was on the rise. Instead of just handing over the whole kit-and-caboodle to one provider, which is how it had been since the dawn of outsourcing, when only giant servicesauruses roamed the earth, more and more firms were going to farm out their IT work to various companies. As an HP technology officer put it, as CIOs got more involved in outsourcing, they wanted to take advantage of the specialist providers that were out there. They wanted to be able to use data center specialists for their hardware infrastructure, for example, and application developers who were the best-of-breed at creating software solutions. This idea of outsourcing to someone with a team highly skilled in ERP or SAP solutions, or mobile apps, or software testing, or whatever, makes total sense. But there's another driver for multisourcing. And that's innovation. In the most recent Harvey Nash survey of CIOs, 39% said they "expect to increase their dependence on multisourcing in the next 12 months." When I talked to Chris Nuttall, principal of PA Consulting, which helps analyze the Nash results, he said: "One reason more CIOs are moving to multisourcing is to obtain more innovation. They are outsourcing more around innovative functions rather than utility functions." Furthermore, he said, this is good news for nearshore IT providers. "They can't typically compete on costs, but they can compete on ideas and innovations." In fact, he said this ability to innovate is one reason Latin America "is becoming more dominant" as a sourcing destination. But then now comes a new report from the respected research house of Ovum in which analyst Jens Butler says: "The mix of major providers in outsourcing contracts has shifted from the much-heralded multi-sourcing approach to a more contained portfolio of suppliers and services in recent contracts." He says there's now a prevalence of "capstone" vendors dominating larger portions of outsourcing contracts. According to Ovum's data, 60% of total contract value is being allocated to one supplier. Customers are consolidating on single providers, "shifting to a single, trusted supplier model," as one reviewer put it. Without further research, I am not going to dispute what the savvy Ovum analysts have found. 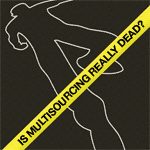 But it seems like a disheartening trend, if indeed, as that same reviewer proclaims, "multisourcing is dead." Maybe for some companies it makes sense to stick with the single supplier. But in wild times like these, it's a mistake to short-shrift the potential for innovation. Ruling out a smaller, more agile software developer because it means multiple partners could be a big, single mistake.